Spending too much time in front of a computer or TV screen? These eye relaxation exercises will help you relax and relieve some of the stress you are imposing on your eyes. My optometrist told me years ago that I can’t keep staring at a computer screen for hours! Of course, it makes sense, but it can sometimes be difficult to remember to take your eyes away from the screen… especially when you have a tight deadline to deal with! My solution? I’ve set up an “alarm” on my computer calendar. Every 50 minutes or so, it beeps, which tells me I need to get up, stretch, refill my glass of water, and mostly take my eyes off my screen! If you are lucky enough to have a window nearby, you can look outside and focus on something far away. Look at birds on the horizon, enjoy the dance performed by tree leaves when wind comes sweeping by… If you don’t have a window near you, look at the furthest wall in the room for a few minutes. 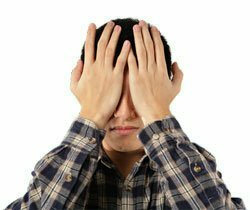 You may have heard of an eye relaxation exercise called “palming”, which is particularly suited to relieve eye strain. It’s perfect for those who spend long hours focussing on a nearby object, such as a computer screen. To perform this exercise, sit comfortably on a chair with a headrest and rub your hands together until they feel warm. Lean your head against your headrest and relax. Place your warm palms over your eyes. If needed, allow your palms to cup a little to prevent them from touching your eyes (it’s OK if they touch your eyelashes). Adjust the position of your hands and fingers until you are comfortable and relaxed. It’s OK if your fingers overlap. While keeping your palms over your eyes, open your eyes to check if you see daylight. If you do, readjust the position of your hands. Close your eyes again and think of nothing but blackness. You may see some remnants of colors, but keep thinking about emptiness and blackness and they will go away. Clear your mind, relax and stay in this position for about two minutes. Take this opportunity to breathe deeply. Slowly open your eyes and return to work. Repeat every 50 minutes or so if you spend long hours in front of a computer. Why Perform Eye Relaxation Exercises? Your eyes are a very precious gift. Take good care of them, and ensure you make time to practice these eye relaxation exercises on a regular basis. If you wear contact lenses, follow the manufacturer’s instructions, and don’t wear them for longer periods. Sure, doing so could save you a few dollars, but keeping your eyes healthy is priceless.